>The Joy of Six show is only a couple of weeks away, and you may be aware that Dave Luff and I are helping out Per Broden running some 6mm Saga games. To that end, we’ve been playing Saga again, after a break of 3 or 4 years. 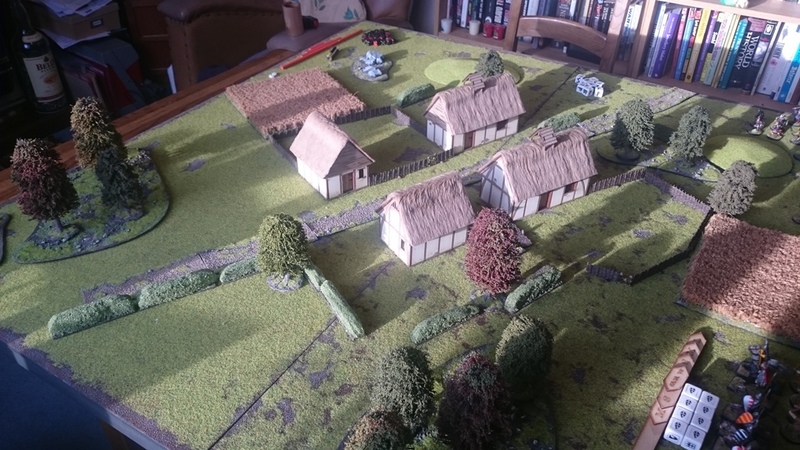 Last night we played a ‘proper’ game with some scenery on the table. To be honest, we simply set up the table in what we thought was an interesting set-up, not really thinking about the scenery set-up rules…more of that later. The resulting combat sees five Sergeants cut down, but two Hirdmen also lay dead. With a loud war-cry, the Norman Knights charge into the Viking Bondi – the combat sees five Vikings fall with not a single Norman casualty. The Bondi retreat through the trees in disarray. The end of the game sees both Warlords with their retinues eyeing each other warily as they disengage. With both Warlords surviving, the final result of the battle came down to a count of victory points. With each side losing 2 Hearthguard and 8 Warriors, the game was declared a draw. Saga is actually very prescriptive on how scenery is laid on the table: you are only allowed a maximum of six terrain pieces on the board (including a maximum of four buildings). We probably complicated matters by adding a lot of linear obstacles (fences and hedges) which we then treated as uneven ground – a rule that is optional, but seemingly sensible. However, due to constantly having to cross fences and hedges, most of the units never managed to move fast enough to engage the enemy. We will probably have to rethink this for future games. I think the one rule change that really confounded us was the changes made in The Crescent and the Cross to the way buildings work in the game. In the original Saga rules, you are allowed within a VS of a building unless that building is occupied by the enemy. In TCATC, you are not allowed within VS of any building, occupied or otherwise, unless you are either moving to occupy it or fighting in Melee with the occupants. Compound this with the fact that we had (as we found out at the end of the game) set up the scenery incorrectly (buildings must be at least an M distance apart from each other) and it made for an ‘interesting’ result that the only way through the village was to move single-file along the dirt track, thus being a VS away from both buildings. We discussed this rule change at length during the game. I can understand why it was introduced: it’s there to prevent a particular cheesy move whereas a unit can move to occupy a building as long as it’s with their movement distance, and then be classed as being in contact with an enemy unit which is with VS of the building that they have just occupied – effectively massively increasing the charge range of an infantry unit. However, not being able to move with VS of any building just seems to be a particularly heavy handed and gamey way to deal with this issue. We much prefer the first edition rules, as these seem to make much more ‘real world sense’. However, the game achieved it’s goal of us playing the game and engaging with some of the more ‘fiddly’ rules. Hopefully these will be valuable lessons learnt for running the games in a couple of weeks.